Sunburns are perhaps the most obvious form of sun damage. But they aren’t just the classic lobster-red colour we associate with a long day spent outdoors; even slightly pink skin means you have a sunburn. If you have a darker skin tone, tender, itchy skin is also an indicator—you might not even see a change in skin colour. Stay with us as we delve into what happens to it when skin gets sunburned, and the vital role sunscreen plays in keeping your skin looking its youthful best! What Happens When Skin Gets Sunburned? UVB (shorter-range) rays cause most sunburn, and are the common contributor to most skin cancers. UVA (long-range) rays go deeper into skin, and are primarily responsible for signs of premature ageing such as wrinkles and sagging. When skin is bombarded with UVB rays, you don’t feel it initially. The physical effects we most often associate with sunburn—skin that’s hot to the touch, itching, pain, peeling, blistering, swelling, even running a fever—are your body’s responses to the excess UV radiation it’s received. It’s trying to do the best it can to fix the damage that’s been done by unprotected or poorly protected skin. Surprisingly, a sunburn doesn’t stop developing once you’re out of the sun. Sunburns can continue to develop up to 72 hours after initial sun exposure, which is why so often a sunburn feels worse days later—and that’s before the unsightly peeling begins. Over time, the visible symptoms and discomfort of a sunburn fade, and your skin will either return to its normal colour or tan (there’s no such thing as a healthy tan, by the way; any change in skin colour means you’ve suffered sun damage). Not being able to see any physical signs of your old sunburn doesn’t mean that there isn’t a lasting impact. 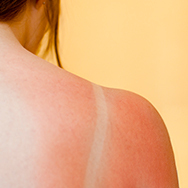 Scary but true: a sunburn changes the way skin functions, even decades after it occurs. Research shows having even just one blistering sunburn during childhood can more than double a person’s lifetime chance of developing melanoma, the most serious type of skin cancer. The cancer likelihood shoots up to 80 percent if you’ve had between two and five bad sunburns during your childhood years. Even if you don’t have a severe sunburn in your history, getting sunburned less severely once every two years can triple your risk of melanoma. The statistics show that sunburn is not something to ever be taken lightly. It shouldn’t be a normal part of your vacation or a day at the beach. We know the info above is pretty scary, but there is an easy way to prevent sunburn. The best way is to apply a broad-spectrum sunscreen, and apply it liberally every two hours when you’re outdoors. Along with sunscreen, other sun protection measures like sunglasses, hats, and SPF-protective clothing greatly improve your chances of not getting a sunburn. Taking such preventive steps not only saves your skin now, but guarantees less worry years from now—and that’s sunburn relief worth the effort.